If you’ve been paying attention to major ERP vendors, you’ve probably heard more than once that businesses should move to a cloud ERP system for a plethora of reasons (AI capabilities, IoT integration, cost, etc.). But making the decision is not simple. A cloud ERP migration can be disruptive for the whole business and could cost you more in the long run, when you factor in monthly subscription costs. Participate in our study on where businesses currently are with ERP, and we’ll grant you access to our brand-new expert guide, ERP Systems: Cloud vs. Hybrid vs. On-Prem. 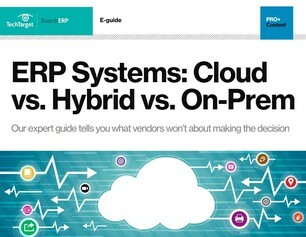 In this guide, our vendor-neutral editorial team explores how companies are approaching this dilemma, with insights from real business leaders, as well as statistics on cloud ERP usage from our members like you.